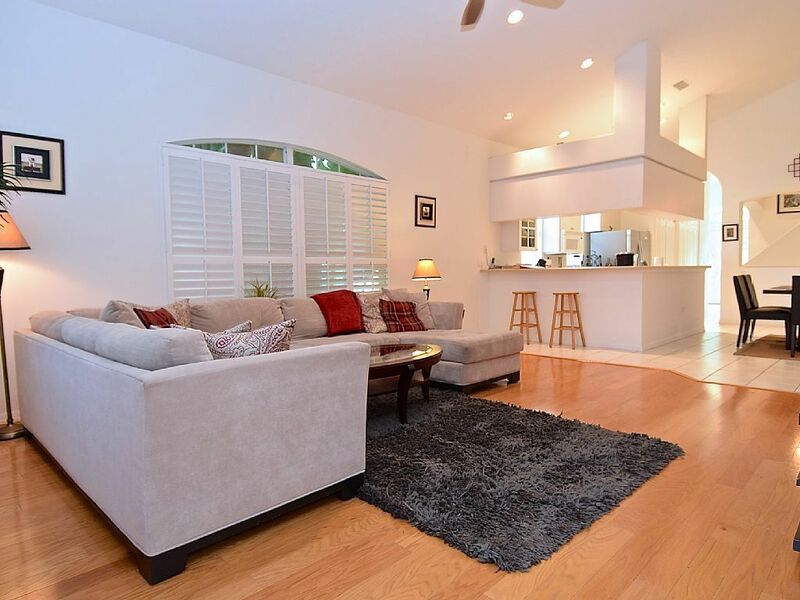 Gorgeous Siesta Key Home with Private Pool & Tons of Extras - Bring Your Family! Beautiful 2 story home with a 2 car garage and pool located in the desirable neighborhood of Bay Isles on the island of Siesta Key. The home has an open floorplan with vaulted ceilings and lots of windows for a spacious, bright and airy feeling. The living room is quite large with a very comfortable sectional sofa, digital flat screen TV and DVD player. Free cable and WiFi are provided.. The den/family room is just off of the living room and is well stocked with board games and a stereo. Sliding doors with wooden shutters give access to the outdoor patio and pool area from both the living room and den. Home has a full size washer and dryer just off the kitchen tucked away in a large laundry closet with doors so it is hidden when not in use. The master bedroom and bathroom are located upstairs and there are 2 walk-in closets, king size bed, and flat screen TV. The master bath has an oversized jetted spa tub, bidet, shower and separate private toilet area. There are 2 bedrooms and one bathroom downstairs. One bedroom has a queen bed and a large closet with built in shelves and drawers. The other bedroom has a bunk beds with a twin on top and full (standard) on the bottom, as well as a futon that makes into a full size bed. The family room/den also has a couch and chair that both convert to beds for additional sleeping accommodations. The pool is heated (solar), screened in, private and sparkling clean. There are 2 patio areas (upper and lower level). BBQ grill, patio furniture and lounge chairs are also provided. A lot of extras are supplied to help make your vacation here a memorable one, including beach toys, beach chairs, coolers, pool toys & floats, tennis racquets, football & soccer balls, a wide variety of board games and movies, bicycles and helmets, and more. We rent the home in 7-night increments during off season, and it must be Saturday to Saturday. Small dogs will be considered with a $200 non-refundable pet fee but we must be notified before your reservation can be confirmed. Vic Harris | Home & Condo Rentals and Property Mgmt., Inc.
About Vic Harris | Home & Condo Rentals and Property Mgmt., Inc.
Home & Condo Rentals and Property Mgmt., Inc. is a family owned and operated property management company specializing in vacation rentals in Siesta Key FL and the surrounding area. Our company was started in 1997, and we are now happy to have 3 generations working to provide the best customer satisfaction possible for our guests. Our office is located on the beautiful island of Siesta Key, and we are members of the Siesta Key Chamber of Commerce. We employ a professional cleaning company in order to assure that your rental is spotlessly clean upon your arrival, and we are available to you 24/7 should any issue arise during your stay. View more about Vic Harris | Home & Condo Rentals and Property Mgmt., Inc.
Ensuite master with jetted tub, large shower & bidet. Guest bathroom downstairs with shower/tub combo. Lovely home on siesta key. Beautifully decorated. Spent a wonderful month here. Hated to leave. Home and condo rental was very responsive the one time i had an issue. Perfect location. Very convenient to the beach, the village, sarasota, st Armands circle and venice. I can’t think of a better place to get away from a cold february. It was a pleasure having you. See you next year! We rented this home as part of a Christmas present to our children and Mothers! It was a great experience! No issues at all! The home was very clean and well kept! The master bed was very comfortable! The WiFi did not work when we got there but when we emailed the company someone was sent out the next day and the issue was taken care of! The pool was clean and comfortable temperature wise! It was very nice having the beach chairs, beach umbrella and cooler to take to the beach! Would recommend and hope to rent again in the future! Thank you for taking the time to leave feedback about the house. You're welcome back any time! Pros: This was a pretty perfect place to stay for a family vacation with small children. Comfortable and clean accommodations and great location - just a short drive to the beach and Siesta Key square. Kitchen had all necessary items for cooking meals, and the grill was a bonus. Garage was stocked with useful beach items - chairs, many toys, and cooler. The pool is small but well-maintained and perfect for kids to play in between vacation activities. Furniture was cheap and somewhat old, but functional and decently comfortable. And honesty because the furniture and decor was cheaper/older I did not have to constantly worry about my children doing any damage. Very nice closet space with built-in drawers/organizers in the closets in each room. Plenty of beach towels and bathroom towels. Cons: Owners/property managers were weirdly stingy with items like toilet paper, paper towels, dish soap, hand soap, laundry detergent, kitchen sponges, and trash bags - many basics were not present and had to be purchased. There were several non-functioning electronics throughout the house - TV in kids’ room, speakers, and sterios (we did not expect these items, but it was an annoyance when we attempted to use them). The cleaning checklist was more extensive than other VRBOs I have stayed in (included stripping all beds), and property managers requested that we start laundry on our departure despite not supplying detergent at the property. The DVDs are a very poor selection and appear to all be pirated and low quality, plus the DVD player in the living room did not work when we arrived and we had to contact property management to fix it (property management was decently responsive). DVDs should be removed entirely from the advertisement for this property. Suggestions for property management: Supply more basics, especially necessary cleaning items. Present cleaning/departure checklist in easy-to-follow checklist format, instead of multiple paragraph email. Remove non-functioning electronics and remotes. Label more light switches (there are SO MANY switches). Don’t charge a large cleaning fee and then request that we take trash to curb on trash day, strip beds, start laundry, etc. Overall, happy with this VRBO and would recommend for anyone with kids who wants a place where you can hang out and cook in between vacation activities. It was not too bad. The biggest problem I found is with garbage situation. I even brought garbage out to be emptied on Tue morning. But it was ignored ?? By garbage man, I guess it was wrong can .. Otherwise, Vik and other people were helpful.. I'm glad you enjoyed your stay! Because your stay was immediately after Hurricane Irma, our county garbage collection services were delayed several days. In normal times garbage collection is done weekly and is not a problem. You are welcome back any time. Location is amazing to local attractions and nice neighborhood. Beds were amazingly comfortable and layout was conducive for different sleeping schedules and privacy. I actually think you could sleep 10 people in this home. Needs some maintenance and better cleaning service.